Book Review – Tragic by Devney Perry + a signed book & gift card giveaway!! <— THIS ONE’S GOING LIVE AT MIDNIGHT!!!! And I was delighted to get an early review copy (this author’s writing and alpha males are spot on and right up my alley). Maria: I’ve been reading her Jamison Valley series and I am OBSESSED!!!!! Tilly: I read Tattered (Lark Cove Book 1) by Devney Perry and loved it! 2nd book is Timid. I love all of her books and highly recommend them! Linda: Reading Tattered by Devney Perry and loving it!! Susan: Have you read book 1 and 2? Maryse: I haven’t but this one reads super-well as a standalone (although I hear the characters cross over). Kathy: I have been waiting for Piper’s story!! So excited to read it! Linda: Love everything she writes!! 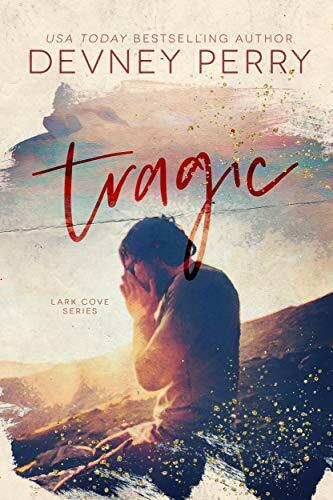 Started Timid (Lark Cove Book 2) last night and only a few chapters in and already just know it’s going to be amazing read. Vicki: Highly recommend anything she writes. Ali: Both of her series are amazing! Even from a distance it was clear that he was the quintessential mountain man, big and brawny. …kneeling on the ground looking like he’s grieving. …besides his rugged appeal, there was something else drawing me in. Something that made me want to wrap my arms around his narrow waist and promise him it would be okay. Reclusive Kaine is trying to overcome his own grief and has secluded himself from everyone (including his own mother whom he loves). He’s been living in his own personal oasis in his run-down cabin in the woods, but that’s just fine with him. He’s not social and he has no intention of entertaining anyway, and just wants to be left alone. Sure… he had neighbors, but they kept to themselves, were vacationers and rarely there anyway. I’d spent two days after her arrival dreading the idea of company up here. I’d gotten used to living up here alone. Even before my former neighbors had passed, they hadn’t been here much. So when she’d stayed away for two weeks, I’d figured she’d given up. I’d relaxed, glad I wouldn’t have to share this mountainside. Then a week ago, right as the May flowers had begun to bloom, and Airstream had backed into her driveway. moving in next door, and begins a full on renovation on the house she just bought. Driving. Him. CRAZY!!!! She obviously didn’t have any boundaries. She’d come marching over to my property without an invitation last month. Then when I’d sent her as clear a get f*cking lost message as you could get, she’d shouted at me through the door I’d slammed in her face. Yep. She’s plenty social and cheerful and well… neighborly, and she’s grating on his last nerve. OH THE FUN!!!! My gaze roamed her face, picking it apart and searching for things I didn’t like. But I came up empty. and some heartwarming, cozy-snuggle moments to melt with into a gooey smiling mess. But even better? Some seriously infuriating moments (and sad ones) too. She flung out a hand, waving me away. 4.5 stars!! <— Nothing toooo angsty, but TONS of feels in ALL directions. One (1) winner receives: A signed copy of Tragic & a $25 Amazon gift card!!!! How to enter for a chance to win this awesome prize? Just leave a comment below (or better yet, if you have one, tell us about your favorite “moody neighbor or reclusive hero” romance book), and by 10pm EST, this Sunday November 18th 2018 (tomorrow night!!!! ), I will randomly select one lucky commenter as the winner. The winner will be contacted and will have 48hrs to respond with a mailing address, so if you are picked, do not delay or you will lose your chance. This prize will be sent to the winner directly by the author. You sold me on this one!! You will love it Nancy!!!! Can not wait to read this one! I love everything Devney Perry writes and can’t wait to read her newest book TRAGIC. She knows how to write enthralling stories with protective alpha males. So excited for the 3rd book in this series. I couldn’t put the others down. LOVED LOVED this series. Thank you, Maryse, and Ms. Perry, for the opportunity! My favorite recluse-type book would have to be Night Owl by M. Pierce. I loved that book hard. And besides, that’s where we got our beloved Manny from. Thanks for this chance to read your books. Looking forward to hearing from you. I just finished Only Love by Melanie Harlow and Ryan is broody, but deep down so darn sweet. This series sounds so amazing and I would love to read it! Oooh, love this! Plus a giveaway? Awesome. I loved the first book in this series! This one sounds just as good. Sounds so good! I can’t wait to read this series. J.B. Salsbury has some good grumpy/reclusive neighbor books. Tragic sounds like a very interesting book. My favorite reclusive hero is Zsadist from the Black Dagger Brotherhood. Thanks for the fantastic giveaway. THIS BOOK SOUNDS SO GOOD!! The recommendations of books you have never fail.